Just getting started or have Moodle already up and running? Get your free eBook version of How to use Moodle by Jaswinder Singh. This may only be available for a limited time before we remove it from our site. Just enter your name and e-mail address below and we will be happy to send you a link to download it right away. 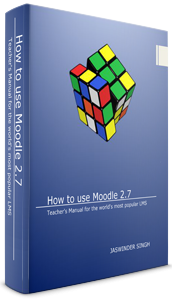 Based on Jason Cole & Helen Foster's Using Moodle 2nd Edition, the eBook edition of How to use Moodle 2.7: Teacher's Manual for the world's most popular LMS will be extremely valuable to course creators, teachers and administrators who use Moodle. This 300+ pages focuses on all aspects of Moodle's standard modules and functionality, detailed information on all settings available to users, teachers and administrators, and screenshots of various Moodle configuration screens. Using a more recent version of Moodle? You will surely still find this book a valuable addition to your Moodle toolbox. The language is clear, concise and easy to work through. Each chapter is well organized and easy to follow. If you're looking for a digital desktop companion or a quick reference guide, this might be just what you are looking for. Get the e-Book Now - You Won't regret It! This may only be available for a limited time before we remove it from our site. Enter your name and e-mail address and we will rush the link to you right away. Be sure to watch for it in your email. Send me the e-book !! !